Oh boy! These haddock goujons are really good! Tender, juicy white fish with crispy, garlicky, cheesey crumb. Serve with oven chips and petite pois, with a side of tartare sauce. Serves 3-4 people. The excellent fish in this recipe was supplied by our favourite fish merchants, Glenn and Lynn, from GVS Quality Fishmongers. about 25oml of groundnut or sunflower oil. 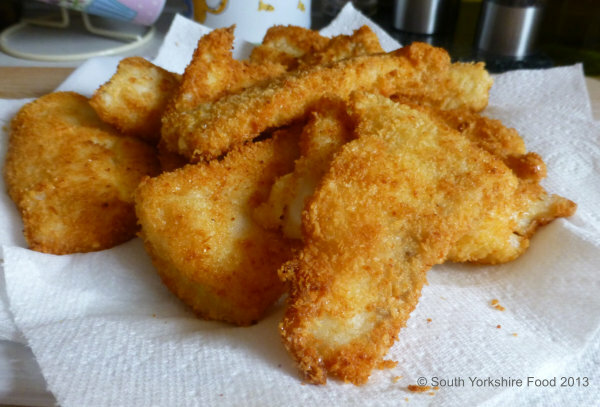 First cut the fish into goujons - strips about 5cm x 12cm ( 2in x 5in). Place on a plate and set aside in the refrigerator until ready for use. Put the panko, garlic, parmesan cheese, salt and pepper in a food processor and whiz for about 30 seconds. This does two things. It ensures that the garlic, parmesan cheese and seasoning are distributed evenly throughout the crumb, and it also makes the crumb a little finer, as panko can sometimes be a little too coarse grained for my taste. Empty the mixed crumb onto a large flat plate. Now put the flour onto another large flat plate and the beaten egg into a shallow bowl. We are now ready to make the goujons. This is the way I do it - a bit like an assembly line. From left to right, the plate of fish, the plate of flour, the bowl of egg, the plate of crumb and lastly, on the right, a plate or board covered in greaseproof paper or baking parchment. With my left hand I take a piece of fish and coat it with flour, shake off any excess and dip it in the egg, make sure it is coated, shake off any excess egg, and place it on the crumb plate. With my right hand cover the piece of fish with crumb, shake off any excess, and place it on the greaseproof paper. Keep doing this with all the fish pieces. Your left hand is going to get covered with flour and egg, and the idea is to try and keep your right hand clean for dealing with the crumb. We do it this way because the flour sticks to the fish, the egg sticks to the flour, and the crumb sticks to the egg! Heat the oil in a non-stick sauté pan. You can tell when the temperature is right by dropping a few panko crumbs into the oil. If they turn a nice golden colour after about 20 seconds then it is about right. If they quickly go dark brown - it's too hot - turn it down! Fry the crumbed fish, in batches, for a couple of minutes a side, until golden. Place on a warm serving platter while you cook the remaining fish.